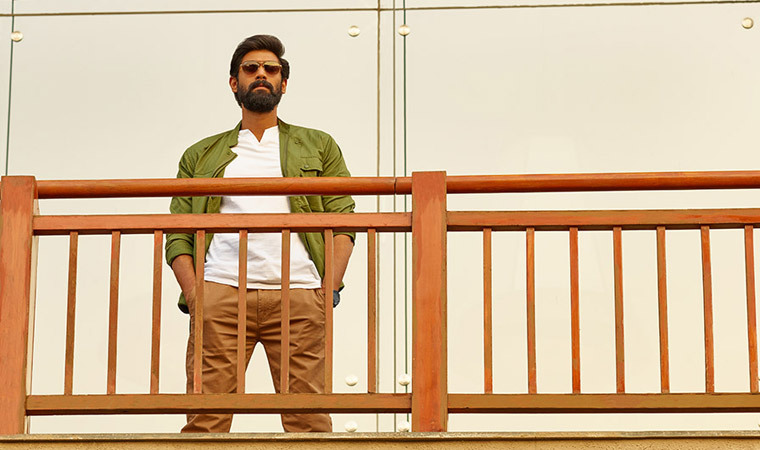 Rana Daggubati is a colossus who straddles many aspects of cinema. Rana Daggubati is a colossus. Literally and figuratively. In real life as much as on the silver screen. He is everywhere in Hyderabad – peppered on ad displays across the city. And you can also sense his star power when a hushed-up buzz spreads across the hotel lobby even seconds before he walks in. In Andhra Pradesh and Telangana, as well as in many parts of south India where Telugu films garner eyeballs, this is one star who is loved and admired. The rest of India saw this Telugu matinee idol in all his larger-than-life glory last year in the biggest blockbuster of all time, Baahubali, where he played the main antagonist Bhallaldev in both parts of the magnum opus. The phenomenon got him the kind of star power his earlier outings into Bollywood could not earn for him. Hailing from the Daggubati-Akineni family, often referred to as the first family of Telugu cinema, he is virtually tinsel town royalty. His uncle is the 1990s superstar Venkatesh while his grandfather is Padma Bhushan- winning film producer, Daggubati Ramanaidu. Only, Rana worked his way up the hard way (knowing the guy, he’d probably call it the ‘fun’ way! ), first working on the technical side, setting up his own VFX studio (even winning a national award for special effects) before moving into acting. Even while being launched like a star kid, what was different about Rana’s approach to the whole medium were his choice of roles. His first film, Leader (Telugu) had him playing a politician with shades of grey. The unconventional choice has continued – from playing an assassin in his second Telugu film to Dum Maaro Dum, his Hindi debut to playing the villain in Baahubali. Even his latest launch announcement, Anizham Thirunal Marthanda Varma, being made in Telugu and Malayalam, is a biopic on the king who made Travancore (in modern-day Kerala) one of the richest and most powerful princely states in India - again a ruler who was ruthless in his ambition and in his approach to his foes. Baahubali is a Telugu film, dubbed in Hindi which has become bigger than any Hindi film. Nobody knew Prabhas or me before this film. But it didn’t matter – (audience) still watched the film. Ultimately, content is king. Rana Daggubati is obviously a man with a lot on his mind. And plate – to call him just an actor or star would be a disservice, the man’s interests range from special effects, the film distribution and production side and much more. Recently, he gave the voice-over for Thanos in the Telugu version of the box office blockbuster Avengers: Infinity War. You are from an illustrious film family, so obviously your launch was well planned. But, you also made some non-conventional choices, like taking up the technical side of films before you took up acting. I’ve been acting for seven years now. Before that I was doing special effects for nine years. I mean, I’ve been working in movies, so it’s just been job one, then job two, and then moving on. And now, I am doing a bunch of jobs together! (smiles). Did you grow up enamoured by gadgets and technology? Why this interest in visual effects? Yes. I am in the movies really because of a film called Star Wars (1977). It made me decide that I wanna be in the movies for the rest of my life. I may have seen it when I was younger, I don’t remember, but I saw it properly when I was in the 8th grade, and watched it zillions of times from then on. Only when you find a new story or a character that’s new, not (like) you, when you understand his traits, that’s really the purpose why (I am) in the movies!..... If I have to look the same in every movie, then I think I (am better off) doing another job. For me, (Star Wars) was the very definition of what cinemas are about – it took you into a world which is never there, ever there, many many years ago, in a land far far away! It is the past and the future which is happening somewhere else. And you buy into that world, you buy into those characters, you buy into that drama. And that’s something that really fascinated me. And I thought, that’s the reason I’d be in the movies. To create a world and get the audience in there. That’s the ideation side. But, you’re majorly into technology. Yes, see, ultimately, no matter what I am doing, whether I am doing technology or producing a film or acting in it , ultimately, it is because I like stories. I like stories, I like movies, I like telling stories through them and I will do whatever it takes to get movies to be made. I do a bunch of jobs for that! So whether I am an actor in a film, or a producer, or whether I am doing just the post (production) of the film...whatever it is, it is ultimately for a story to be made. A film, in whole, excites me more than anything else. Is technology something that fascinates you personally? You are so much into photography as well. That’s what I really studied – industrial photography. Earlier, before I used to be in ads, I used to shoot them (laughs).That was 2002 and special effects were new. I was called by a studio which wanted me to use a 3D camera. Instead of doing it on a computer, we shot 3D objects. That’s when I really understood special effects. When you are really young and you come across something new, you keep doing that! Knowingly or unknowingly, 7-8 years passed and now I have a company with 120 people working in it! You’re a star-son who could’ve planned and got into films as a star exactly the way you wanted, but you went to a lot of other aspects. So was there something addictive about it? I was born in the movies, in a house where film shootings used to happen. Literally! My father’s a producer, my uncle’s an actor, my grandfather used to be a producer, my mother used to run a film laboratory, all of that is part of my upbringing. So I grew up watching a lot, hearing a lot, understanding a lot more. So I guess, I could take a lot more paths in the movies. Also this while spending months on preparing a role is something you keep doing, and relish – you did it for Baahubali, you’re doing it for Haathi Mere Saathi. A few Bollywood heroes try it in India, but that’s about it. You seem to be doing it in a big way. For me, that’s the only reason I am in the movies. If I have to look the same in every movie, then I think I (am better off) doing another job. Playing the same role again in another movie is not so interesting for me. And people who are watching it will know if I am not interested in a (particular) role. So might as well find something new, that’s unique that keeps you going. Only when you find a new story or find something new to tell, you’ll be excited in shooting that film, in making it better. When you find a character that’s new, not (like) you, when you understand his traits, that’s really the purpose why you are in the movies! I didn’t grow up in a ‘star’ environment. I grew up in a studio environment - I come from the reality part of cinema! Being famous is a job. Very few people look at it like that. I still have my desk to go to, an office to attend. See, I live here (Hyderabad), but you guys landed up here (for the cover shoot and interview), right? (Pauses, and breaks into a smile)...For me, what’s important is telling stories and making movies that are interesting. It really doesn’t matter which language it comes in – it’s time stories travel. I did two films last year, one was Baahubali and the other was The Ghazi Attack, both were in Hindi. Both were released in Hindi and Telugu. This year, there is Haathi...which is also shot in (both) Hindi and Telugu. Depending on what story it is, I tell it in whatever language is possible for it. Do you find Bollywood chaotic or complex? I make movies and I send them there. So I am fine! I am not part of the everyday hustle and bustle of Mumbai. It’s hard to answer that, when you’ve been watching all kinds of films since you were a kid, you like many things. I like science fiction, I like war dramas, comedies, I like mafia movies...there’s a whole gamut of movies that I like. So, I guess at some point, I would be re-creating something or the other of things that I like. Most films you do are a visual memory, or a liking, as a child. Ultimately, you do certain films because you like those movies. Before you are an actor or doing anything in the movies, you were an audience first. Coming back to my earlier query, do we get to see you more in Bollywood, or in other (than Telugu) languages? I have Haathi, I am doing a film called Marthanda Varma – I am doing that in Telugu and Malayalam, but it will be dubbed in Tamil and Hindi. One thing I noticed about the roles you have played (or are playing) in films thus far is that the characters all have a lot of shades. Right from your first Telugu film where you played a righteous man who becomes a chief minister and goes astray to the later ones. Did you select such roles consciously? Yes, I didn’t go down that route at all. Nowhere in India has a visual effects supervisor become an actor (bursts out laughing). I have a different understanding of movies. Did you think that Baahubali would be this big? I don’t know what you mean by ‘this big’. We all knew we were making something bigger than what anybody’s seen. All of us went away for five years – no movies, nothing. It was Rajamouli’s vision and all of us, me and Prabhas (fitted in). We stuck together for five years - we didn’t know if it was going to take one year, two year or five years, whether it will take 10 crore, 20 crore, 100, 200 or 500 crore. We didn’t know. But we said, let’s just make the greatest movie. And we did. That would mean you expected it to be a hit, but not on this scale. When we spent twice more than the biggest film that ever released (in India), I think we were aiming big. We were not aiming small. What we knew was that we were making a true blue Indian film.We were confident that though we didn’t have any Hindi actors, it will be a big Hindi film. It is a Telugu film, dubbed in Hindi which has become bigger than any Hindi film. So ultimately, content is king. Nobody knew Prabhas or me before this film out there. But it didn’t matter – they still watched the film. What role do you think we will never see you in? I don’t know. None, probably. I’d like to do as many as possible! How would you best describe yourself – cheerful or quiet? I am easy with things. I am not complicated. I am a straight-shooter. Being famous is a job. Very few people look at it like that. I still have my desk to go to, an office to attend. It’s also tough, isn’t it? Even if you control yourself, you somehow change. Yeah, but then I didn’t grow up in a ‘star’ environment. I grew up in a studio environment. Most of the time studios lose money on films! (laughs). So I come from the reality part of it! What do you do during your off-day? I watch a lot of movies. And I read a lot. I live with my parents and siblings, so free time is spent with the family. In between Netflix, Apple TV and books, I would say I have a hectic off-day! You connect even your hobbies to work. Would you call yourself a workaholic? I don’t know what else to do! It is so much fun that I keep doing it!